When Thanksgiving rolls around, if you listen closely enough, you can probably hear my brain getting audibly excited because it’s about to scarf down some delicious pumpkin pie. I’m talking about those wonderful $5 Costco ones that have no business being that cheap, that large, and that delicious. But as much as I love me multiple helpings of some PP, there’s no doubt that the star of the show is the turkey. Sure, sides are amazing, but if your bird ain’t cooked to perfection, then Thanksgiving is kind of a disaster. Then there are some people who decide to go a little too “out of the box” when crafting their Thanksgiving turkeys, and the results are just ghastly. Listen, I love Flamin’ Hot Cheetos and pretty much flamin’ hot anything, as evinced by the Costco-sized box of various individual packs of the chips that are currently waiting in my kitchen for my next cheat day. But breading your turkey in this stuff is just asking for an awful Thanksgiving and if you’re crazy enough to try this recipe, then I feel bad for you and your family. You almost want to applaud the folks over at Chowhound for coming up with this turkey cake. In theory, it should work, because it’s got all of the Thanksgiving flavors we love. But something about a mashed potato frosting, with layers of ground turkey, only to be topped off with sweet potatoes and marshmallows, makes me want to run to the bathroom for a holiday evacuation. So this was created as a gag by the brilliant mind of Male Chef and posted to their Tumblr page. Even if you throw up all over yourself as a joke, the fact is that you’re still covered in vomit. The sight of this turkey marinated in knock-off Gatorade is so blargh-inducing that it’s making me sick just looking at it. Who hasn’t been sitting around the Thanksgiving dinner table while shoveling bits of dry turkey into their mouths thinking there just has to be a better way of consuming bird meat so it flows more easily down your esophageal tract? We’ve all been there. 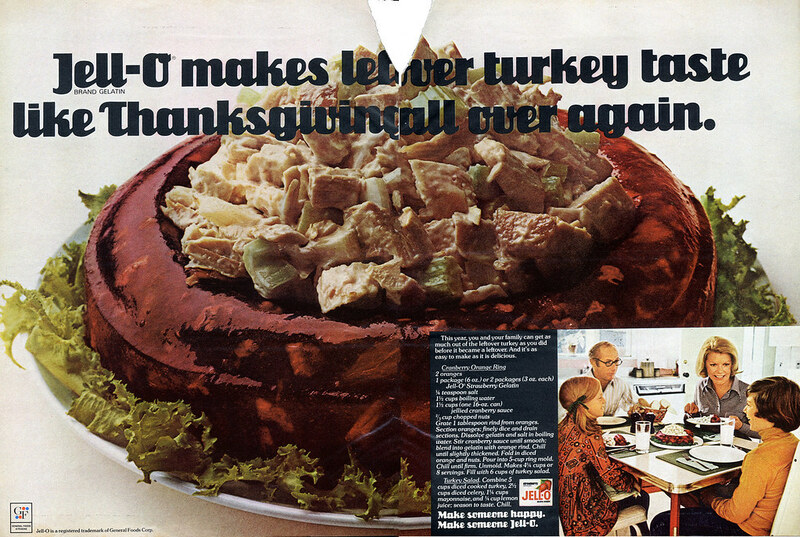 I present to you this abominable solution: Turkey Jell-O. Begone Satan, begone. Now I have a gripe with sushi on the basis that it’s cold rice and uncooked meat and other stuff all mashed together to give you a “meal,” but I promise you that my distaste for it has nothing to do with my disgust with this idea. I’m sure even the most avid sushi lovers would admit there’s a time and place for sushi and a turkified Thanksgiving version of it isn’t it. Props to Leslie Leyland Fields for creating this unique Thanksgiving treat, but I think we’ll pass. Pizza is delicious. Pizza is comforting. When it comes to comfort foods, however, it doesn’t get more comforting and homey than Thanksgiving. However, combining these two things looks just plain nasty. Sure, just top a pie with white American cheese, cranberry sauce, sweet potatoes, gravy, shreds of turkey meat, and Brussels sprouts. It looks like someone who overate on Thanksgiving decided to order a pizza, and then proceeded to barf all over said pizza. No thanks. I really feel like casserole gets a bad rap. The word “casserole” just sounds gross, and yes it’s associated with bland home cooking that we’d only eat because there’s nothing else in the fridge and we don’t have the money to eat out. But a mayonnaise-based hodge-podge of Thanksgiving staples tossed into a pan then baked in an oven sounds like a sadistic plan to insult your guests on Thanksgiving. It’ll be a meal to remember, but the memories won’t be fond. Look, I get that deep-frying things is sometimes great, but when you take an entire turkey and throw it into a vat of oil, you’re just asking for trouble. 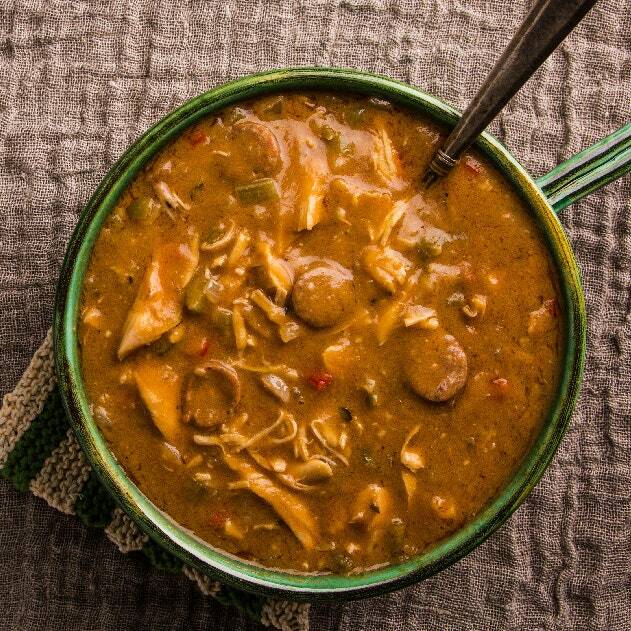 Sure, there are ways to cook it so it’s not a dry ball of nastiness, but at what cost? Dads love grilling all year round and will usually look for any excuse to do so. Thanksgiving shouldn’t be one of those days, and this papa shows exactly why when he attempted to cook a Thanksgiving Turkey on an outdoor grill and ended up burning the poor thing to high hell. Burritos can be great, as long as the ratios of all the ingredients on the inside are correct. But there’s something about mixing up all of the flavor profiles of Thanksgiving Turkey and all its side dishes and putting it into a flour tortilla that just seems off. Please don’t serve this on Thanksgiving and if you’re wondering what to do with your leftovers, maybe stay away from this recipe altogether.